Every once in a while an album surfaces that is like a time machine. I am not referring to all the new psych albums, as the sounds they produce could not have been made in 1967. No, I'm talking about singer-songwriter style albums that could have been made in the 1970s on the U.S.' West Coast but are from 2018. Now Residing Abroad by The Furious Seasons is such an album. Acoustic guitars, soft singing, a slightly gloomy mood following the lyrics on longing, loss, yearning and things not here but there, out of reach. Absolute beauty caught on tape or digits. The Furious Seasons sounds like it was born 40 years too late, yet in time to replace the slowly lost heroes of the past. And then I started to read up on the trio. David Steinhart is on the musical beat since 1984 and formed this trio in 2006 with his brother Jeff on bass and Paul Nelson on guitar and harmonies. Now Residing Abroad is the band's 6th release. I can't tell anything about the past, as I haven't heard any of the band's music. Fact is that I'm tremendously and pleasantly surprised by what I'm hearing. Thoughts of Tim Hardin, Jim Croce, John B. Sebastian, Bread, Harry Chapin, the acoustic Neil Young and Marty Balin and many others come to mind who scored hits in the late sixties to mid 70s and played these slow moving singer-songwriter songs with an ever so slightly jazz-tinged flavour to their music. 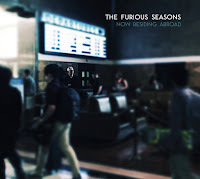 The Furious Seasons lay down a beautiful mood on Now Residing Abroad. A mood for a time long gone and of innocence lost. In 2018 the whole world is watching in amazement at the speed with which the national and international order is shaking on its very foundations. The Furious Seasons appear to be a beacon of stability in uncertain times. A buoy to anchor a ship on in a too rough sea. "The chaos subsides as the seasons change" Steinhart sings with his soft voice in 'Status Quo'. It seems like he knows what he is singing about. Under the soft singing that often comes closest to the voice of Bread's David Gates, there are two acoustic guitars at work. David Steinhart and Paul Nelson intertwine their instruments in delicate ways. The upright bass lays the soft foundation under it all. Every once in a while one guitar escapes for a firm solo. All that is relative of course, the music being as brittle as it presents itself. It compliments the singing in the most beautiful of ways. Did I like this music in the 1970s? The answer is a definitely maybe. Somewhere on the fringes of my musical awareness there was 'Guitar Man' or 'W.O.L.D. ', Rod Stewart's 'Maggie May' or 'Reason To Believe'. That was about it for me around 1974. Now I'm confronted with music that sounds just like it and I am nearly swept away. Now Residing Abroad certainly strikes a chord in me and not for the last time I'm sure.